Will you be helping us fill up Loftus? All roads lead to Loftus Versfeld on the 31st of March. With your help, we are going to try and fill up the stadium in order to bring some much-needed relief to our fellow South Africans in Cape Town. 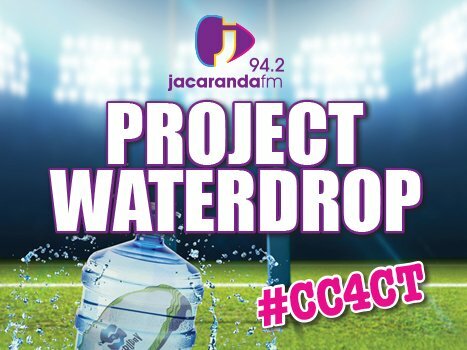 Jacaranda FM's Project Water Drop is in full swing and with only a month to go, the excitement is starting to build. The #JacaFamily, its listeners and their friends and families will all descend upon Loftus Versfeld on the 31st of March for what is bound to be an unmissable event. For Cape Town, #DayZero has been looming, with many dreading the day and thousands trying to save as much water as possible. However, this is a reality and it can happen at any time. Have you ever been to a full Loftus Versfeld stadium before? We can definitely imagine that the vibe, camaraderie and thousands of South Africans uniting for one cause must be a spectacular sight to see. We found some incredible footage showing a full Loftus Versfeld. Will we be able to fill up one of the biggest stadiums in Gauteng? Bring your family, friends and everyone in your neighbourhood as we make history and lend a helping hand to those in Cape Town. Tune into the station that brings you #MoreMusicYouLove to find out more as we lead up to the big day.